It’s tough not to be pessimistic about Alan Connell’s future at the club. The cracks in the foundations of the seldom seen squad player are only exacerbated by the news that nominal Club Captain Ricky Ravenhill – who’s been in the same boat this campaign – has put in a transfer request due to a lack of first team football. This gives me no joy to note. I really like Alan Connell; I thought his introduction may have been more useful than Folan’s at the hour mark against The Monstars on Sunday. Especially after Folan’s slow start last week where although imposing, he was well off the pace. (It also must be noted he replaced James Hanson after arguably Hanson’s best ever performance.) Alas, my opinion is of little influence or insight, and Folan did well in his half hour, coming as close as anyone to breaking the deadlock. This isn’t a eulogy; Connell could still come back and play a role this season, but it’s looking mighty unlikely right now, and we can be forgiven when surveying the landscape for pouring one out for the blond forward. He’s just miscast. He always has been in this team. Connell hasn’t the pace of a Wells, nor the physique or burst of a Hanson. The rest of the team (understandably) haven’t learnt to play without one, let alone both of their starting forwards. Connell’s playing from a different hymn sheet to both of the starters, and the rest of the team stood harmonising behind them. That underlying point is the most frustrating thing about the situation. I don’t think Connell is Nahki Wells, but he’s not a bad player; he shouldn’t be typecast as ‘Division Four’, a moniker that seems his destiny. He could play at this level, in the right situation. But that’s the thing. James Hanson and Nahki Wells are both clearly good, and young, enough to build a system around. They were worth persevering with. They are worth creating that situation for. Is Alan Connell? He turns 31 this year, is out of contract in the summer, and realistically, in League One, where are you if Connell is your main man? The problem with a system-specific player like him at this level is, to be valued, you better be bloody good. You’ve got to offer a competitive advantage. Hanson is winning about 85% of all balls in the air this season, and Wells is the prodigal son. So that makes sense. That’s a real, and true competitive advantage. Alan Connell is very good at what he does, but cannot do what he doesn’t do. Without a spot in that hole behind the frontline, he struggles to impact the game. In a team as dependent on straight lines as this, it’s a tough situation if you can’t work with square pegs. I was thinking about what he would need to excel, and without having the pace to slot out wide, or the defensive nous to play as a “Number 8” it is tough to find him a home. Someone like Sheffield United makes a bit of sense. There they have a team definitely capable of keeping the ball on the deck moving forwards, and could do with more firepower and someone to dictate from the ten spot, though I wonder if someone with his track record would entice them. Perhaps someone like Rochdale or Wimbledon in the division below? For Connell to succeed regularly, he needs to be in a ball playing team that is dependent on their ’10’ dropping off and linking play, with on-running pace from deep. A predominantly counter-attacking, meat and two veg 4-4-2 team, City never use that position. The only exceptions when chasing the game, and even then they are more prone to nail it up to Hanson or Thompson, leaving the Number 10 to fight it out for the second ball. I always thought, and still think there would be a future in Wells and Connell if the rest of the team could learn to play balls consistently into the feet of the forwards, and the midfielders pressed on, but James Hanson is playing out of his mind at the minute, and has been for about six months. What’s more the team know how to fire long balls into the channel, and with the mobility of Hanson, it’s a gold mine. A query I have, and have had, is why isn’t there a proper understudy for Wells? Phil Parkinson has spent the past 12 months trying to ensure he had a replacement for Hanson in his recruits of Gray and Folan, and to an extent, Thompson before them. Yet despite the fact the risk of him losing Wells through injury or transfer was and is far higher than Hanson, why isn’t there another speedy forward on the books? Given all the huffing and puffing I’ve just put in explaining how we really only play one way well, why isn’t there a back up for the main man? I don’t know the answer; it’s odd. They are probably too expensive, but even a kid? Zavon Hines filled in a few times last year looking half decent at times. It’s intriguing that there wasn’t a replacement bombing winger recruited who could slot in if required. One glaring takeaway from that second half on Sunday was that without Kyel Reid, there is just no pace, no dynamism anywhere in that team without Wells. I love KYEL REID HERO-BALL as much as anyone, but it’s a curious situation that is what we had to resort to that quickly. So without an obvious home in the squad for Connell, then what happens? You become typecast as a role player, ‘Need a Goal Man’, not a starter, and that is exactly what has happened to Connell these last few years. Swindon used him as an impact sub, where he excelled, leading their scoring charts as they were promoted. He left The County Ground in the summer after promotion for Valley Parade with the expectation to be a starter in a side on the up. And he was, initially. He started the first two games of the year, but the side just looked, and were, more dangerous with Wells in the team. An acknowledgement in itself that shouldn’t be a death knell for a player, really. The Bermudian took Connell’s starting position and never let out of his grasp as he and James Hanson led the side to promotion, with Connell reprising his role as the eager hype man coming off the sidelines. Something which is key. The small, tight-knit group worked wonders last year; the team spirit was through the roof. A fact which at least contributed that was how many games there were to go around. Everyone played a role at some point. They had to this season, not so much. We’ve been knocked out of most things already. By October 14 last year, City had played 1,500 minutes on the field in 16 games, Connell contributing 655 of those minutes. This season those numbers are 1,170 minutes in 13 games and Connell only featuring in 149 of those minutes, and they are both set to proportionally drop as the season progresses. Last year’s content Ricky Ravehill quickly became disillusioned this year, it’s a valid question how long this great team spirit will last amongst this squad without squad rotation to keep them appeased. Last year’s club captain, this year’s odd man out, Ricky Ravenhill even has a role as shut-up-shop merchant. Or he did have one anyway until recently. Set to go out on loan, his future at the club seems exactly as bright as you’d think a shut-up-shop merchant’s would. If Sunday’s game had any predictive power, and there is a future for a Hanson-Folan partnership, Alan Connell is struggling for game time. Yeates has jumped him for The Hole, and the only reason Connell took the field on Sunday was Wells being absent. But even an injury and an ominous home defeat only buys him quarter of an hour. He doesn’t have any other strings to his bow. And his main (maybe only) position is one we normally don’t play. But on the rare occasion we do, someone else [Yeates] is ahead of him for that too. In attempting to look on the bright side for Connell, I bigged up the role of impact forward in my player season previews, as they are normally on the field when the team needs goals, and will be in a position to benefit statistically, and eventually financially, because of it. Connell did exactly that at Swindon, and to an extent, for City last year. But now with Folan on the books, Connell appears to have lost that spot. So… now what? He’s teetering on Andy Gray Purgatory. It’s a tough spot. Save a quick run of goals, there isn’t a clear route to the field. He needs us to be at home, and trailing, and someone to be injured, to even get a substitute appearance. He has never shown any frustration with his role, which is admirable, and if he’s happy with what is essentially fifth fiddle, then beautiful. If you are going to overpay for depth, you do it in attack. If he’s OK with it, then he’s as good as a 4th/5th centre forward you’ll get at this level. But he’s better than that. He could go start for a talented League Two side today. I’d have faith in him going to somewhere in our division and excelling in the right circumstances, but is that option likely? He’s never proven it at this level. Although granted his defence that he hasn’t really had a chance at City or Swindon is solid. I sometimes wonder how much Alan Connell knew of Nahki Wells before he arrived. I wonder if he knew what he knew now, whether he’d sign. City were a low scoring bottom dweller not 18 months ago, saved by a seldom-used 21 year old in Wells and an underwhelming goal-shy target man in Hanson. Connell could rightly have assumed to have been a guaranteed starter. Then Nahki Wells happened and Connell ended up in the same position as he was at Swindon, but a division below. Perhaps ‘League Two goalscorer’ is his ceiling, in the same way Ross Hannah was a fifth tier forward, and Will Atkinson and Ricky Ravenhill may be a fourth tier midfielders. But hell, is there really any fundamental difference between Alan Connell and Chris Dagnall? Dagnall has been in the Championship for years, without starring. Is he a ‘Championship forward?’ The idea of levels is awfully dependent upon circumstance. And those circumstances seemed destined to place a ceiling above the head of Alan Connell. Turning 31 this season, this may be his final chance at this level. He may have a future as a latter-day Jamie Cureton, bouncing around League Two, remaining productive well past his expected shelf life. It’s not outlandish given Connell’s skill set (which shouldn’t diminish over time), and the wear and tear he’s avoided over the last few years. He is out of contract at the end of the season, and despite his age, one would assume he’d be able to latch on somewhere in League Two with an ability to rectify a few of the wrongs from this season. Although this may be dependent on a loan move to get in the shop window. For the moment, he’s a useful, if seldom used, squad member for City who hasn’t shown a second of dissatisfaction. 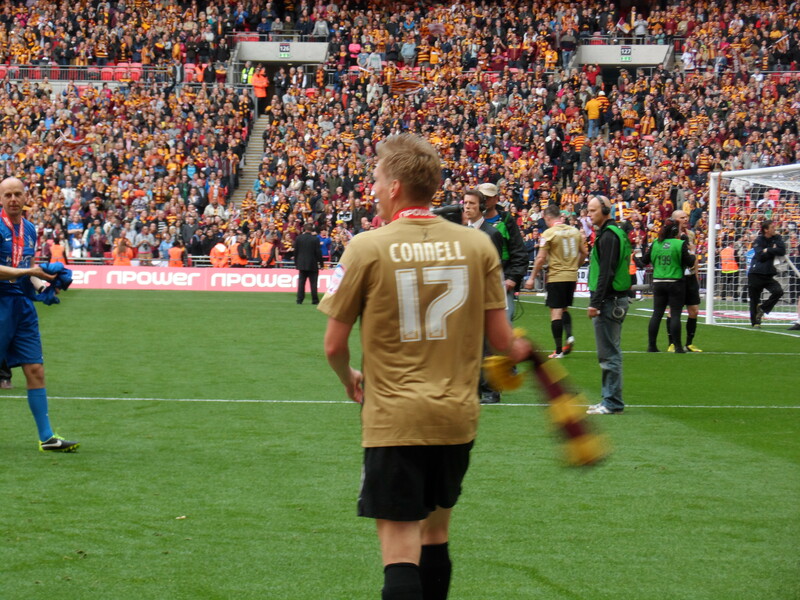 How long as that last point lasts will likely define how long Connell stays at Valley Parade. It may be that Ricky Ravenhill is the canary, and the outsiders in this talented, if shallow, squad begin to look elsewhere for their future in the post-rotation era. Agree with most of what you’ve said, but I think Connell is better than League Two level. I think his style of play means he needs a team built around him, so to speak, or, as you said, a club that keeps it on the deck like Sheffield United. I think he looks effective when he comes on and plays just behind Hanson and Wells, and he does create chances, but it’s difficult to see how he’ll fit in when you factor in Folan and Yeates, especially with Yeates being the first choice starter at the moment. But I like Connell and I hope he gets more game time in the future, but I feel it’s a case of him being impact sub over here or playmaker somewhere else.